What do you do when your ex leaves you for his A-list actress ex girlfriend? How do you land a musician boyfriend? What’s it like to make a total jackass of yourself when you meet that actor you’ve had a crush on for years? What would When Harry Met Sally… look like in 2013? Am I hungry? 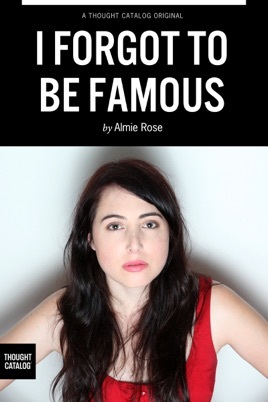 These questions and more are answered and explored by Almie Rose in I FORGOT TO BE FAMOUS, essays and how-to’s about dating, relationships, living in Los Angeles, and how they all crash into each other, like the car chase scene in the mall in the Blues Brothers movie, which she hasn’t seen, but is not at all opposed to.